Brazil - The Order of the Daughters of the King, Inc.
Brazil National Board - President Camen Andrea Blaas (far right) and Liaison Elisabeth Sherrill (far left). Daughters of the King had supported two missionaries in Brazil (Carmen Wolff, Elizabeth Daniel) before Rev. 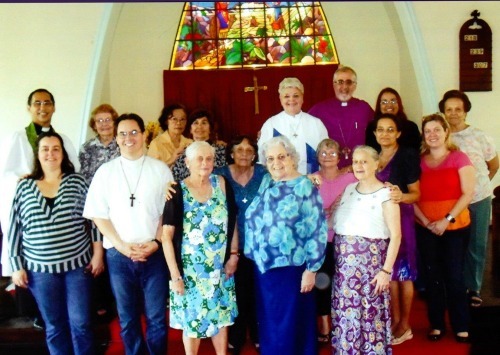 Pat Powers began her ministry and introduced Brazilian women to the order. The first chapter was instituted in August of 1981, and more were flourishing when Ethel Ripley visited them. In 1998 they formed a national assembly. Their officers attended our 2000 Triennial, and in 2006 their president and another charter member represented them. Dr. Deborah Ajakaiye attended one of the DOK Brazil triennials. October 18, 2014 was a great day for the Daughters of the King® Brazil as their National Headquarters, The Mary and Martha House was inaugurated with the presence of the Diocesan Bishop, The Right Rev. Humberto. More than 70 representatives from all chapters in the diocese as well as clergy and lay members gathered together for a Eucharist of thanks. The celebrant and preacher was the Reverend Canon Patricia Powers, assisted by Helena Castal, National President. The service was followed by a communal lunch and social hour. The dedication of the Mary and Martha House in Porto Alegre in the Diocese de Meridional was simple but filled with deep meaning, and all could feel the presence of the Holy Spirit blessing all participants. A plaque was presented featuring the name of the house, date and the names of the "Godmothers", the Rev. Canon Patricia Powers and Elizabeth Daniels. A large wall copy of the Daughters of the King® was also unveiled and blessed. The afternoon activity was a workshop on the Gifts of the Holy Spirit and how these gifts can be used to benefit each individual Daughter, the chapter, the local church and the Diocese. The Mary and Martha house will function as a retreat house, a meeting place for weekly Bible studies, a transient home for women coming to the city for treatment who are in need of short term housing, and a place for National Board Meetings and future Triennials. The house consists of a chapel, meeting room, kitchen, living room, bookstore and two bedrooms. It will also be open to other women's meetings. The Bishop of the Diocese de Meridional gave the house to the Daughters and it is their responsibility to maintain the property. the Brazil table during the International Dinner at the US Triennial 2015. This Triennial, 15 years after their first Assembly, was held July 26-28, 2013, at Igreja da Redentor (Church of the Redeemer), Porto Alegre. With hugs, kisses, and translated introductions, Susan O'Brien (National Secretary) was welcomed into and embraced by the community of Daughters in Brazil. Over the next few days, they worshiped together, explored the theme of spirituality, broke bread, checked off items on a business agenda, and enjoyed expressing their spirituality in song. In one of the workshops, Bishop Humberto (Diocese of the South, Brazil) challenged them on how they were living into their vows as Daughters. After learning about and then walking the labyrinth (recently introduced in Brazil), they met in small groups to discuss their assigned questions. Paraphrased, Susan's group's question was: How are we serving our parish and the greater Church as we live out our vows? When discussions concluded, they gathered again in the large group, heard various readings from John's Gospel, then walked the labyrinth again. Breaking into the same small groups, they reflected on how their answers changed after meditating on the Bible readings. Susan felt this is a good exercise for all of us to do - individually or in our chapters. Included in the study of the spirituality of music was the singing of "Lift High the Cross." As they lifted their voices and hands singing the refrain (in Portuguese, of course), Susan felt connected to all the Assemblies and Triennials throughout the years in the States and to the community of Daughters around the world. speaking at the opening service for the Triennial. showing the new International DVD at the Assembly meeting. Susan O'Brien and Brazil Assembly President, Helena Ramos, exchanging gifts. The labyrinth, new to Brazil, was a part of the workshop that Bishop Humberto led. It was on heavy paper and set in the middle of our meeting room. and passed it the next, who passed it to the next, and so on. by Rev. Nicolas, Pat+ and Elizabeth. the Rev. Pat Powers for the Assembly. Here she is standing before a mural in the City of God in Rio. the All Saints Chapter at the Parish of All Saints in Novo Hamborgo to renew their vows. as well as the dean of the Cathedral of the Resurrection, Rev. Magda. held in Paroquia do Redentor (Church of the Redeemer). Bishop Filadelfo is standing in back beside Pat Powers. including Noreen Smith (center front), who attended the 2006 Triennial in Orlando.